Orchids at Palm Court offers nightly fine-dining dinner service with a contemporary American menu by the American Culinary Federation’s USA Chef of the Year Todd Kelly. Orchids features an extensive wine list by Maitre d’ Charles Redmond and desserts by Top Chef Just Desserts Chef’testant Megan Ketover. Afternoon tea service available Saturdays September through May. 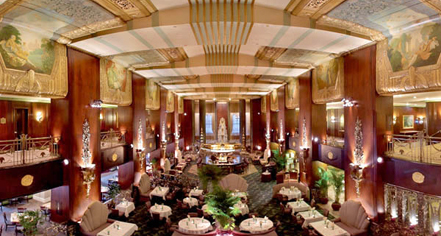 The Grille at Palm Court is located on the upper tier of the Palm Court. The Grille offers a casual breakfast daily with a expanded buffet, lunch Monday-Saturday with a popular weekday build-your-own pasta bar and Sunday Brunch with freshly carved meats, seafood, made-to-order omelettes and waffles, and a 20-foot dessert display.